The House of Representatives voted last Thursday to pass HR 1254, the Synthetic Drug Control Act of 2011, which would criminalize not only synthetic stimulants ("bath salts"), but also synthetic cannabinoids ("fake pot") marketed under names such as "K2" and "Spice." The bill passed on a roll call vote of 317-98. 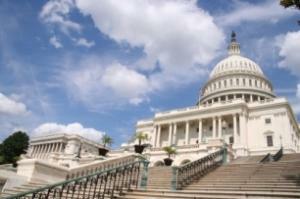 Sixteen Republicans joined with 82 Democrats to vote against the prohibitionist measure. At least 40 states have passed bans on the new synthetic drugs, and the DEA has placed both fake pot and bath salts under emergency bans. The bill would make both sets of substances Schedule I drugs under the Controlled Substances Act, which would pose substantial impediments to researching them. Scientists have warned Congress that placing the synthetic drugs under Schedule I will have a chilling effect on ongoing efforts to explore treatments for a range of diseases and disorders. Under the bill, prison sentences of up to 20 years could be imposed for the distribution of even small quantities of the new synthetics. Seeking some small solace in the wake of the vote, Bill Piper, national affairs director for the Drug Policy Alliance, which had lobbied to defeat the bill, said it was "significant" that nearly a hundred members of the House had broken with drug war orthodoxy to vote against the bill. Going in the face of an ever-increasing clamor to reform decades of failed drug policies, the US House of Representatives is poised to pass two bills that promise more of the same. The House is set to vote any day now -- the vote was originally set until Wednesday night, but was pushed back -- on HR 1254, the Synthetic Drug Control Act of 2011, which would criminalize not only synthetic stimulants ("bath salts"), but also synthetic cannabinoids ("fake pot") marketed under names such as "K2" and "Spice." "This is almost certain to pass," said Grant Smith, federal affairs coordinator for the Drug Policy Alliance (DPA), which has been lobbying to try to stop it. "We're doing our best to try to block it, but it's unlikely we will succeed," he said. The bill foresees prison sentences of up to 20 years for the distribution of small quantities of synthetic drugs. But despite an intense debate in the House Judiciary Committee last month over the bill's implications, it is moving ahead. At least 40 states have passed bans on the new synthetic drugs, and the DEA has placed both fake weed and bath salts under emergency bans. The bill would make both sets of substances Schedule I drugs under the Controlled Substances Act, which would make them difficult to research. Scientists have warned Congress that placing synthetic drugs under Schedule I will have a chilling effect on research intended to explore treatments for a range of diseases and disorders. The bath salts drugs -- primarily methcathinones like mephedrone derived from the khat plant -- have been associated with spectacular bad reactions, including increased blood pressure, increased heart rate, agitation, hallucinations, extreme paranoia and delusions, and some reports of violent behavior. Fake pot has been associated with less dangerous bad reactions, including confusion, nausea and panic attacks. Horrible drugs or not, evidence from Britain suggests that some people like them quite a bit. According to an August report in the Guardian, which cited recently released scientific research, "Mephedrone is more popular among UK clubbers than ecstasy despite being banned." But Congress was on a different wavelength. In a statement typical of congressional discourse on the issue, in a September hearing, Rep. Charles Dent (R-PA), the sponsor of HB 1254, first listed a number of anecdotal scare stories, then proceeded to warn his colleagues that the drugs were not innocent. "These substances are marketed with innocent sounding names," he said, "but these labels are total misnomers designed to facilitate their legal sale. These drugs have no legitimate medicinal or industrial purposes." "We are in a new era of drugs," said Sen. Diane Feinstein (D-CA) at the same time, as she prepared to deal with them with the same approach Congress has taken with other drugs -- by banning them. The second bill, HR 313, the Drug Trafficker Safe Harbor Elimination Act of 2011, introduced by veteran drug warrior Rep. Lamar Smith (R-TX) would make it a criminal offense to plan to engage in an activity in another country if that activity would violate US drug laws if committed in the US -- even if that activity is legal in the country where it takes place. While Smith and other bill supporters say the legislation is aimed at drug traffickers who conspire in the US, opponents point out that it could just as easily be applied to someone who makes plans to attend and partake at the Cannabis Cup in Amsterdam, work at a safe injection site in Vancouver or any of the other 64 cities that have them, or work in a medical marijuana program in Israel. 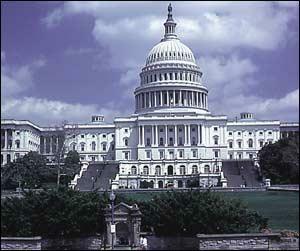 All of those activities are illegal under federal drug laws and thus subject to the purview of the bill. "Since the war on drugs was declared 40 years ago, the US has spent more than one trillion dollars and arrested tens of millions of Americans for drug law violations, yet drugs are readily available in every community and the problems associated with them continue to mount," said Bill Piper, DPA director of national affairs. "When you're in a hole, you shouldn't just keep digging," he added. "Facing massive budget deficits, policymakers from both parties should be searching for alternatives to prison for nonviolent drug law offenders, because locking them up is only making us poorer, not safer," said Piper. "The US can't incarcerate its way out of its drug problems and should stop trying. The only way out of the drug war mess is to start treating drug use as a health issue instead of a criminal justice issue." "By rushing to criminalize synthetic drugs, Congress is condemning more Americans to years in prison and ignoring warnings from the scientific community that this bill will hurt medical research," said Smith. "Outright criminalization compromises both public health and safety by shifting demand for synthetic drugs into the criminal market. It would be more effective for Congress to pursue comprehensive drug education and create a regulatory framework to reduce youth access to synthetic drugs. This approach is working for tobacco, which has contributed to more deaths than alcohol and illicit drugs combined." The DEA announced September 7 that it was using its emergency scheduling powers to impose a ban on three synthetic stimulants widely marketed as "bath salts." 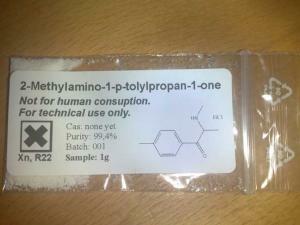 The three drugs are mephedrone, methylone, and 3,4 methyleneoxypyrovalerone (MDPV). But the ban on bath salts drugs comes as a rising chorus has begun to criticize the prohibitionist approach to new drugs, with European researchers noting that new synthetics have been emerging at a rate of one a week in the past 18 months. The ban does not go into effect for at least 30 days, after which DEA will publish in the Federal Register a Final Order to ban them for a year, with a possible six-month extension. The emergency ban makes it illegal to possess or sell the three substances while the DEA and the Department of Health and Human Services (DHS) conduct further studies to determine whether the substances should be permanently controlled. In the meantime, the emergency order will designate the bath salts drugs as Schedule I controlled substances. "This imminent action by the DEA demonstrates that there is no tolerance for those who manufacture, distribute, or sell these drugs anywhere in the country, and that those who do will be shut down, arrested, and prosecuted to the fullest extent of the law," said DEA Administrator Michele Leonhart. "DEA has made it clear we will not hesitate to use our emergency scheduling authority to control these dangerous chemicals that pose a significant and growing threat to our nation." The bath salts drugs appeared in the US in the last couple of years and are sold under names such as "Ivory Wave," "Vanilla Sky" and "Bliss," but according to reports from poison control centers and hospital emergency rooms, their effects can sometimes be anything but blissful. Reported effects from users seeking help or being transported for medical attention include disorientation, extreme paranoia and violent episodes. According to the DEA, 33 states have already moved to ban or otherwise regulate the bath salts drugs, and the agency cited "an increasing number of reports" of problems related to the substances as a reason it moved to ban them. The DEA declared a similar temporary emergency ban on synthetic cannabinoids earlier this year, but a report from the British newspaper The Guardian on Saturday suggested such an approach to new synthetic chemicals may be a losing battle. 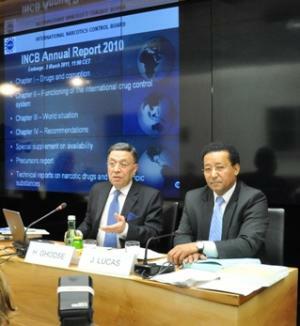 That article noted that the European Monitoring Center on Drugs and Drug Addiction had reported the emergence of 40 new synthetic drugs in the first five months of this year. Many of those reported new drugs were derivatives of methcathinone, as are the three drugs banned Wednesday by the DEA. Given the plethora of new substances, researchers and analysts told The Guardian that attempting to ban new drugs is not a feasible solution. Instead, they should be studied, regulated, and controlled.According to Paulo Deluca, co-principal investigator at the European Union-funded Psychonaut Research Project, which studies new drug trends, it's becoming hard to even keep up. "It's also becoming very difficult to know exactly how many new compounds there are, because you have all these brand names and when you test the batch they are different from the following one," he said. Attempts to ban one new substance after another are like "a cat chasing its tail," said Steve Rolles of the Transform Drug Policy Foundation. "Each time they ban one, another emerges. It seems to show a blindness to the basic market dynamic, effectively creating a void for backstreet chemists to create another product." Rolles added that new drugs should be studied and regulated like conventional drugs. "It's just ridiculous, irrational really. If you're not looking at the regulatory options, then you're not following an evidence-based approach -- you are following a political mandate." But enforcing prohibition is the mandate that the DEA has -- or rather, attempting to enforce it. And as unlikely as they are to succeed at that goal, they are are equally unlikely to ever willingly embrace evidence-based policies, the new ban shows. Although new synthetics are coming to market faster than governments can ban them, a number of states have moved in recent weeks to criminalize their possession and distribution. In Florida, Louisiana, Minnesota, Pennsylvania, and Wisconsin, state governments have enacted bans on synthetic cannabinoids ("fake pot") or synthetic stimulants ("bath salts"), or both. In South Dakota, they took a slightly different path to arrive at the same end. 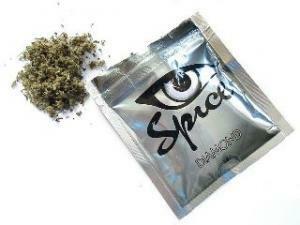 Synthetic cannabinoids are marketed as "incense" under a variety of names, including Spice and K-2. They are currently the subject of a one-year emergency ban by the DEA, which is set to expire at the end of February. "Bath salts" are made from methcathinone analogues, typically mephedrone and MDPV, and produce a high likened to cocaine, methamphetamines, and ecstasy. The DEA lists them as a "drug of concern," but has yet to act against them. They are sold under names like Bliss, Ivory Wave, and the less mellow-sounding Charley Sheene and Drone. 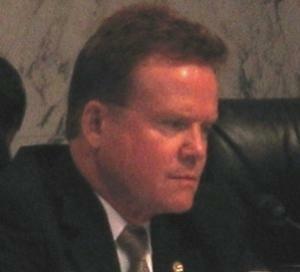 In Florida, Gov. Rick Scott (R) signed into law House Bill 1039 on May 31. It criminalizes the possession of "bath salts" by making them a Schedule I controlled substance. The new law makes permanent an emergency ban on the drugs that went into effect in January. In Louisiana, the legislature has passed House Bill 12, which bans both synthetic marijuana and "bath salts." Gov. Bobby Jindal, who in January issued an executive emergency ban on the synthetic stimulants and who made this bill part of his legislative agenda, is expected to sign it shortly. Under the bill, both fake pot and "bath salts" will be classified as Schedule I drugs and their possession or distribution will be punished accordingly. This bill is set to go into effect July 15. In Minnesota, Gov. Mark Dayton (D) has signed into law HF0057, which criminalizes bath salts, fake pot, and 2-CE, as well as any substances that are "substantially similar" in chemical structure and pharmacological effects to illegal drugs. That law goes into effect Friday. Although all of the substances are placed on Schedule I of the controlled substances list, possession of fake pot is a misdemeanor and sale of fake pot is a gross misdemeanor. Possession or sale of bath salts or 2-CE is a felony. In Minnesota, at least, retailers are fighting back. Three of them filed suit in Hennepin County (Minneapolis) District Court Monday charging that the law is too vague and broad and is not backed by scientific proof. They also argue that the law provides no criteria for determining if a substance is "substantially similar" to an illegal drug and that the ban infringes on individuals' right to privacy and pursuit of happiness. Consumers and retailers won't know "if they're committing a crime or not," said attorney Marc Kurzman, who is representing the stores. "You shouldn’t have to get the answer by being charged and going through criminal trials," he said. In Pennsylvania, Gov. Tom Corbett (R) last week signed into law Senate Bill 1006, which bans the possession, sale, and use of fake pot, "bath salts," and, for good measure, the psychedelic designer drug 2-CE and salvia divinorum. Possession of the proscribed substances can earn you a year in prison, while sales or possession with intent can get you five years. The law will go into effect in late August, 60 days after it was signed into law. "If left unchecked, synthetic drugs could have developed into the most dangerous drug crisis since methamphetamine labs found their way into our state,'' Corbett said in a press release announcing his signature. "This ban on synthetic drugs sends a strong message that Pennsylvania will not tolerate the use of these chemicals." In South Dakota, Gov. Dennis Daugaard (R) back in March signed into law Senate Bill 34, which will go into effect Friday. In deals with the fake pot and "bath salts" "threat" not by criminalizing them, but by making it a crime to use, possess, manufacture, or distribute them -- or any other substance -- to get high. In South Dakota, it is already a crime to have ingested an illegal drug; now, it will be a crime to ingest legal substances if it is for the purpose of intoxication. In Wisconsin, Gov. Scott Walker (R) last week signed into law Senate Bill 54 criminalizing the sale, manufacture, and possession of synthetic cannabinoids and synthetic stimulants. Possession of synthetic cannabinoids is now punishable by up to six months in jail for a first offense and three years in prison for a second offense, while manufacture or distribution garners up to six years in prison. Possession of synthetic stimulants now garners up to a year in jail for a first offense, while distribution of manufacture earns a number of years in prison, depending on the quantity involved. "By classifying dangerous synthetic narcotics as illegal in the state of Wisconsin we are giving law enforcement the ability to take these destructive substances off of our streets and out of our neighborhoods," Gov. Walker said in a signing statement. 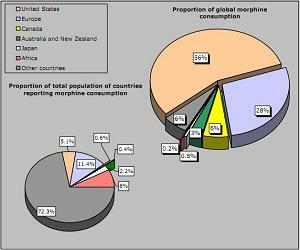 For a master list of states that have banned or are considering banning or otherwise controlling mephedrone and MDPV ("bath salts"), go here. For a master list of states that have banned or are considering banning or otherwise controlling fake pot, go here. Kentucky has become the latest state to ban the synthetic stimulants mephedrone and MDPV, which are commonly marketed as bath salts. Gov. Steve Beshear has signed into law House Bill 121, which makes possession of the substances a Class B misdemeanor and manufacturing or trafficking in them a Class A misdemeanor. The drugs are reported to have effects similar to cocaine, ecstasy, or methamphetamine. Poison control centers and hospital emergency rooms have reported an increasing number of incidents involving people using them. The drugs have been banned in a handful of states, but are not currently illegal under federal law. "This bill gives law enforcement another tool to protect Kentuckians from substances that are engineered specifically to mimic illegal dangerous drugs and allows Kentucky to keep pace with an ever-changing drug market," Gov. Beshear said. Kentucky passed a law banning synthetic cannabinoids last year. This year's mephedrone ban also adds new chemicals to the list of banned cannabinoids to reflect chemicals developed since that law was passed. Utah has become the latest state to ban new synthetic drugs. Gov. Gary Herbert (R) signed into law Friday HB 23, which bans both synthetic cannabinoids and mephedrone, or "synthetic cocaine." The "emergency" measure went into effect immediately upon being signed by the governor. Synthetic cannabinoids are typically marketed as incense under brand names including Spice and K2. They are currently banned in more than a dozen states, with action pending in others. The DEA attempted to implement a nationwide ban as of Christmas Eve, but was blocked by legal moves on the part of retailers' groups until Tuesday, when a federal ban went into effect. 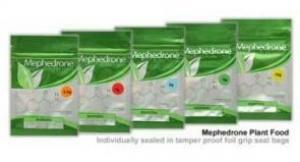 Mephedrone, a derivative of methcathinone, the stimulant substance found in the khat plant, is commonly sold as "bath salts," under names like Ivory Wave. Users report that it has cocaine-like or amphetamine-like effects. It has also been banned in Alabama, Florida, and Louisiana. The DEA has not yet moved against mephedrone. The Utah law criminalizes 17 synthetic chemicals, all synthetic cannabinoid or methcathinone variants. They now go on the state's list of controlled substances, and their possession, sale, or manufacture becomes a criminal offense. Gov. Herbert said after signing the bill that he didn't expect that to be the end of it. "Things change," he said. "What we face today is different than 10 years ago, and I expect my grandchildren will face different situations in the future."